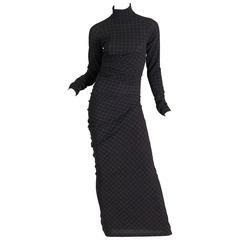 JEAN PAUL GAULTIER rare maxi jersey dress with detachable sleeves featuring an x-ray screen trompe l’œil jean jacket and jeans on the front and back. This dress features : - Grey jersey background featuring distressed black/white x-ray screen trompe l’œil jean jacket and jeans. - Stretchy fabric. - Turtle neck. - Maxi length. - Set of detachable long sleeves with straps that go over each shoulder. - Unlined. Label reads GAULTIER JEAN'S. Made in Romania. Size tag reads : 40. Please refer to measurements. Composition tag reads : 90% Viscose / 10% Elasthanne. Indicative measurements taken laid flat and unstretched (double bust, waist and hips) : shoulders approx. 34 cm (13.39 inches) / bust approx. 41 cm (16.14 inches) / waist approx. 37 cm (14.57 inches) / hips approx. 43 cm (16.93 inches) / length approx. 145 cm (57.09 inches). CLOTHES CONDITION CHART - New or never worn : item is in perfect condition with no noticeable imperfections. - Excellent : item has been worn and may have not more than two minor imperfections (such as for example : faint stains or halos, pulled threads/seams, minor discolorations, etc...) - Good : item has been worn and may have more than two noticeable minor/moderate imperfections (stains, halos, marks, discolorations, micro holes/tears/snags, pulled threads/seams, etc...) - Fair : item has been worn and has noticeable major alterations (such as : stains, halos, holes, snags, tears, marks, discolorations, pulled threads/seams, etc...) Please note that most clothes may have been reviewed by a seamstress. NOTES - This is a preloved vintage item, therefore it might have imperfections. - Colors may differ slightly from actual product appearance due to differences in lighting conditions. - As a buyer, you are fully responsible for customs duties, other local taxes and any administrative procedures related to imports into the country of destination. A worn area (lower back area) featuring pin head holes : little or not at all noticeable from front (see pic 9) ; visible from inner side (see pic 10). Pulled seams (no consequences / see example on pic 11). Fabric pilling (usual for this model).